If you already got AZ-100 and AZ-101 you’re fine. You don’t need to take the AZ-103. Yes, you will be consider has an Azure Administrator Associate. I have completed AZ-100. Do you suggest me to take AZ-101 before May 1 2019 or shall I wait for AZ-103.Thanks in advance! If you already have passed on AZ-100 you don’t need to do anything else. You will get the Azure Administrator Associate certification. All this options are valid options for you to get the certification. 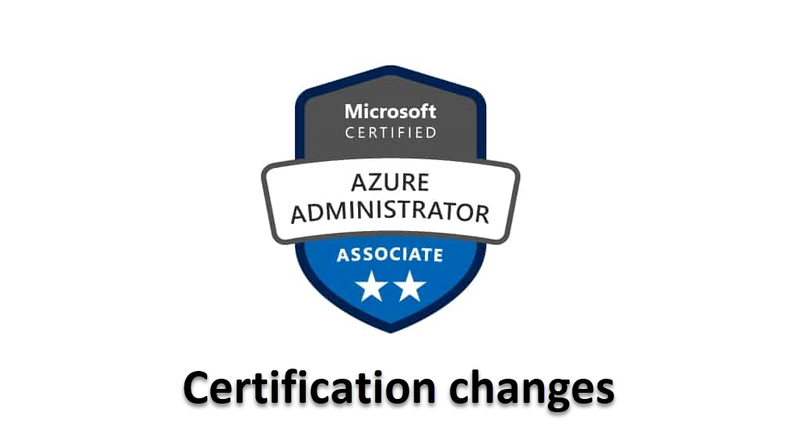 So “Microsoft Certified: Azure Administrator Associate” and “Microsoft Certified: Azure Administrator” is the same thing? It seems these are used interchangeably in the official blog. Yes, they are referring to the same certification. Hi, I am looking forward for AZ 100 certification before it retires. I would like to know which is the last date for appearing for the same. Is it 30th April 2019 or 1st May 2019? Because I notice that as I try to schedule the exam at one of the exam centers in my vicinity, it is giving me an option of scheduling AZ 100 on 1st of May 2019. So should I go ahead and schedule it for 1st May 2019? I need to schedule the exam today, hence request a revert on urgent basis. If the Person Vue allows to schedule up to that time you should be fine, but if it was me I will schedule it to a few days before that date. You might get a small personal issue, Testing center might also have some issues etc.. If you’re on the last day you don’t have any other chance to take the AZ-100. I will try to find if it’s really up to (including) the 1st of May that you can still take AZ-100. Hope this helps.